You are a being from God. You are good and beautiful. 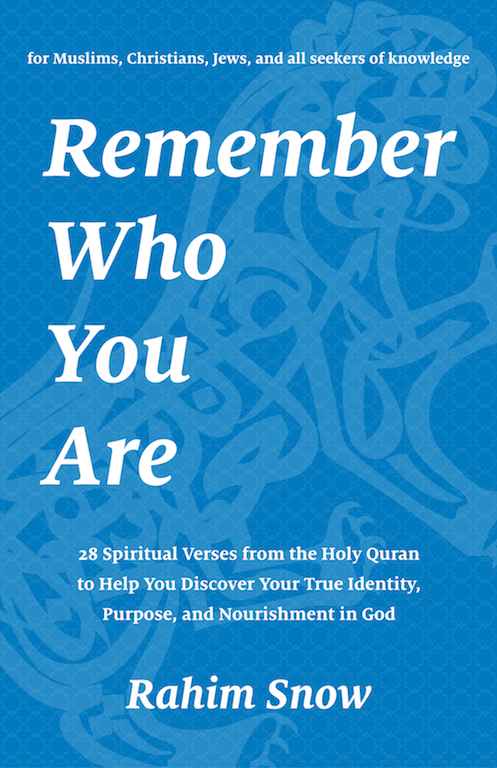 Remember Who You Are is a practical handbook of spiritual teachings based on 28 core verses from the Quran. Each verse is translated into simple readable English and accompanied by a teaching / reflection / commentary / examples that show you how to apply that verse in your daily life. These core verses represent the essential ideas of a universal spirituality. Muslims, Christians, Jews, and all seekers of knowledge can use them to go deeper into their own practice. When you learn any subject, you first have to learn its foundations, elements, grammar, alphabet, building blocks, etc. Spirituality is no different. This book contains all the core ideas of a universal spirituality: who you are, who we are, who God is, and how to live a good life in remembrance of those foundational truths. The goal of religion is to relink your mind and heart with the truth of who you are, who we are, and the One we all come from. Everything else about religion is secondary. This book avoids dogmatic clinging to past traditions by focusing on that original goal of religion. This book is not only inspirational, but also instructional. It wants to teach you so that you might learn. The chapters are short, the writing is simple, the examples are practical, so you can start using these ideas in your daily life today. The teachings in this book reflect 30 years of study into religion, spirituality, mythology, and psychology. The interpretations have strong foundations and rich layers that cross cultures and generations. Beyond the headlines, this book gives you a window into the real teachings of Islam — the faith, the spirituality, the ethics, the search for knowledge, the service to humanity — that more than a billion people strive to live up to. Written from an interfaith perspective, this book honors the teachings of Muhammad, Jesus, and Moses. Muslims, Christians, and Jews will find their own faith reflected in it clearly. This book can serve as a bridge for people of faith and seekers of knowledge to come together and discuss and learn how much we all have in common. Readers are giving this book to their parents. They are reading passages to their kids. Couples are reading this book to each other. Book clubs are reading it together. It is written for a broad audience so anyone from the age of 15 - 115 can enjoy it. This book helps you remember the truth, goodness, and beauty that is in you. It builds you up, encourages you, and supports you. If you know anyone who could use a little support, give it to them as a gift from your heart to theirs. This book makes a beautiful birthday gift, graduation gift, Christmas / Eid / Hannukah gift, get well gift, etc. a multitude of women and men. and toward the wombs that gave birth to you. Surely, God is watching you. Who are the most important women in your life? Is it your mother or daughter or sister or cousin? How did your father regard your mother in comparison to himself? How were you taught to see your sister in comparison to yourself? What do you think about your daughter in comparison to other little girls and boys? In other words, how do you see women in comparison to men? No matter what country we visit, no matter what culture we explore, no matter what level of education we reach, the dominant idea among men is this: men get to rule and women get to play a role under his rule. Even nice guys carry this dominant idea. Men have conspired with each other to create a world culture that crowns men in all matters. Men believe that they have a God-given right to rule, but that rule is the most abusive form of tyranny.Men believe that they have a God-given right to rule Women have been the worse casualties of this tyranny because they have been prevented from exercising their own God-given rights. They have had their own opportunity to speak, influence, and lead taken away from them under the threat of violence and death. So where did men get the idea that men are superior and women are inferior? From the lie that whispers in their own minds and hearts that they are the rulers and women are their property. From other men who are also following the lie. From the nightmare of history, which is a long brutal record of that lie. From the values and norms of a world culture built on top of the lie. This lie says that God made a man first because men were made to lead. It says that God made a woman out of the man because women were made to serve and follow men. It claims that the superiority of men is the natural order of things as well as a commandment from God above. This is what the lie teaches, but God teaches something else altogether. This verse says that God made the first woman and the first man out of a single being. God made the first woman and the first man out of a single being The woman was not made out of the man. The man was not made out of the woman. Both women and men share the same nature with each other because they were created from that single being. All the blessings, gifts, names, and qualities that God gave to that single being were passed onto each and every woman and man made from that being. That’s why there is no difference in the physical, mental, emotional, moral, and spiritual capacities of women and men. This account of the creation of all human beings announces the equality of women with men, especially since they share the exact same origin. It tells us that a human being comes in two forms: woman and man. A human being is not a man who is accompanied by a lesser version of himself called a woman. They are both equal. They are not like the sun and the moon; they are both suns or they are both moons. So what do we do with the truth of women and men being equal while living in a world culture that denies this truth? We have to serve all women by working for the equality of women everywhere As ambassadors and artists of God, there can be only one choice in front of us: we have to serve all women by working for the equality of women everywhere. As the verse indicates, we have a duty to God to place no limits on women and men that God himself has not placed. That means we have to dismantle a world culture built on top of the lie and rebuild it on top of equality. What can the men among us do to help? We have to transform our own minds and hearts so that we recognize all women as our equals. We have to renounce our loyalty to the lie and become fierce allies to women and their equality. We have to examine our own unexamined prejudices, biases, and fears regarding women. We have to uncover and uproot our distorted understanding of women as lesser human beings. We have to stop being the center of attention and give the stage and the spotlight to women. We have to listen to women and follow their lead. Only then can we be a part of the movement to dismantle and rebuild those values and norms of our world culture that doesn’t recognize the equality of women and men everywhere. This includes those of us who think we are nice guys just because we have never physically hurt a single woman in our lives. It’s not enough to be a nice guy and still perceive women as less than men. Don’t be a nice guy; be a fierce ally. It’s not enough to be a nice guy and still let a culture that discriminates against women continue to operate, unchecked and unchallenged. Being a nice guy is not an accomplishment, but a refusal to get involved. Don’t be a nice guy; be a fierce ally. Be ready and willing to stand up for equality by speaking out against every form of inequality. When you hear other men talk about women in disrespectful ways, speak up. Don’t just laugh along with your boys. Talk to them about how men can start changing the conversation they have with each other about women. Don’t be a nice guy; be a fierce ally. When members of your family talk down to your mother, your daughter, your sister, your aunt, or your niece, speak up. Ask them if the prophets Muhammad, Jesus, and Moses talked down to the women in their lives. Start a movement in your own family to speak to all women with respect and honor. Don’t be a nice guy; be a fierce ally. When your workplace gives all the men promotions and ignores the women, speak up. Talk to everyone who will listen and do everything in your power and influence to create more opportunities for women to take leadership positions. Don’t be a nice guy; be a fierce ally. When your society upholds laws that deny equal rights to women, speak up. Contribute your time, effort, and knowledge to help the appropriate organizations and movements to change those laws. Don’t be a nice guy; be a fierce ally. When your culture tries to put walls around your daughter by making her think that she is only supposed to be interested in a handful of subjects because she’s a girl, speak up for her and tear down those walls. Teach her that her interests and pursuits can be as wide as the heavens and the earth and beyond. This is the spacious freedom that God himself has given to her. And no man can take that away from her, not even her own father. Don’t be a nice guy; be a fierce ally. When your culture tries to train your son to become numb to his conscience and to behave aggressively toward women as a sick and twisted attempt to feel powerful in the world, speak up for him and teach him a better way. Work for the equality of women by raising sons who will work for the equality of women. Teach him a large-hearted definition of what it means to be a man, like the one Muhammad, Jesus, and Moses followed. Work for the equality of women by raising sons who will work for the equality of women. Don’t be a nice guy; be a fierce ally. Once you begin to serve all women in this way, you will begin to recognize who they really are. Women are powerful beings from God. They are one-half of humanity. All of God’s names and qualities have been given to them as blessings and gifts. They are more than capable of leading the world, advancing knowledge and compassion, and celebrating our oneness and difference. Once women and men embrace each other as partners and allies, they can finally be healed and reconciled to one other. And once women fully reclaim their God-given rights, the world can finally be made whole again. Work on changing your insides by learning that God made women and men equal by making them out of a single being. Men don’t decide what women can be, what they can have, or what they can do. Women decide that for themselves based on what God has already given them. And what God has given, let no man try to take away. When we perceive women as less than men, when we take power away from them, or when we make them silent and invisible, it robs us of our humanity and dignity. Only by honoring women as our equals can our full humanity be restored to us. In this way, we are called not only to champion the equality of the women in our lives, but to create a world culture that champions the equality of women everywhere. God created women and men from the same being. I work for the equality of women everywhere. In a time when Islam is understood less and less, there is a genuine desire among many of us to learn about the faith of more than a billion Muslims around the world. There is no better place to start than the Quran itself. Yet the Quran is not a book we can easily read without a good deal of background information. What if we had a friend who could help us take the first step by giving us an introduction to the core spiritual teachings of the Quran? In Remember Who You Are, Rahim Snow guides us through 28 core verses to help us discover our true identity (who we are), purpose (why we are here), and nourishment (what feeds us). Each verse is translated into simple readable English and accompanied by a practical and friendly teaching that shows us how to use that verse in our daily lives. Not only do these verses give us a strong and vivid introduction to the Quran, they also help us go deeper into our own journey of faith, knowledge, and compassion. In times of rapid change, we need reminders of the timeless and the changeless. In times of conflict and division, we need bridges of hope and reconciliation to bring us together again. Remember Who You Are helps us remember our truth, beauty, and goodness so we can embody it more fully in the world. And it inspires us to build bridges so we can embrace and serve all people without exception.